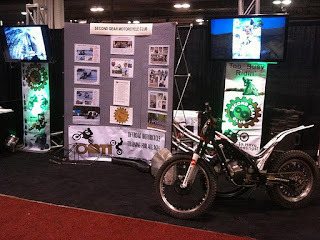 The Second Gear Club and the Offroad Motorcycle Training Institute (OMTI) had a great weekend meeting new people and visiting with so many familiar faces. Lots of comments from people looking for the trials demo that the show was unable to offer this year. But we were able to reach out to many people with super videos on two 47" TV's that Memory Express allowed us to use in our booth. Great setup. Thank you to all that stopped by for a visit and to our volunteers that worked in the booth giving out as much information as we could. It's hard promoting our upcoming ice season with the warm weather and unfortunate cancellation of Jan.15th Chestermere race, but we strived to spread the word on the upcoming races. Mitch did a great job with presentation and setup and then continued to hang out all weekend with Laurie Ann (ice coordinator), Stephen (trials co-ordinator), Rob, Lexi, Shelby, Siggi & myself. There were many others that helped out for one or more days (Rob, Jody, Chuck, Scott, Kathy, Lana, Ken, Barry, and more). 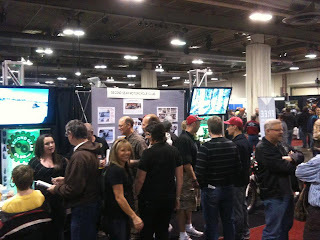 Saturday and Sunday, the booth was so busy, I'm not sure who all helped out. 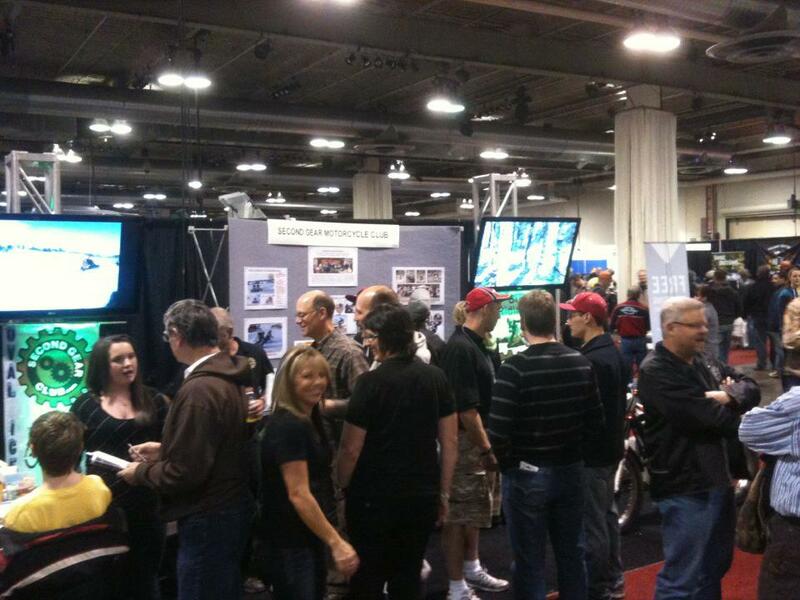 There was a steady crowd at the booth...was crazy! SGC faces were seen all over the show, many helping out with dealers, manufacturers, other clubs and businesses. Michelle and Brittany worked for the Yamaha school all weekend too. 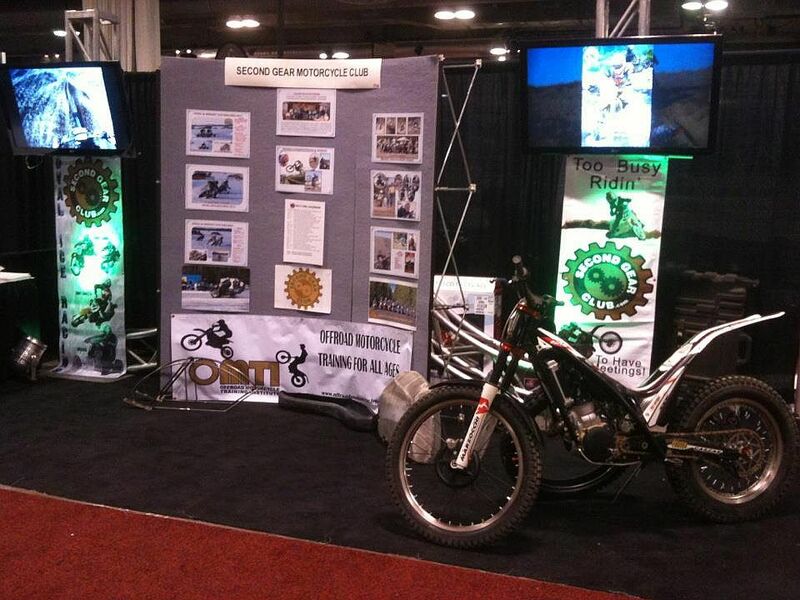 With the steady line of 6-12 year olds excited to ride a motorcycle for the first time and with our booth positioned so close, I think our youth hare scrambles group might have grown for 2012! The Club has been making a presence at the show for quite a few years now (at least 6) and seems to be a regular now. Many specifically made a point to stop by, how cool is that! Was also nice to promote Donny Ellis, club member and new owner of Pro Action Suspension, who is now on a mission taking schooling and learning the very respected business that the late Chris Bonneau developed. We will get a link posted on the website and I believe he will be up and running in February...just in time for the spring setup season.